ICROSS® 1610 is suitable for a smooth fishing kayak to the Fisherman / Hunter. 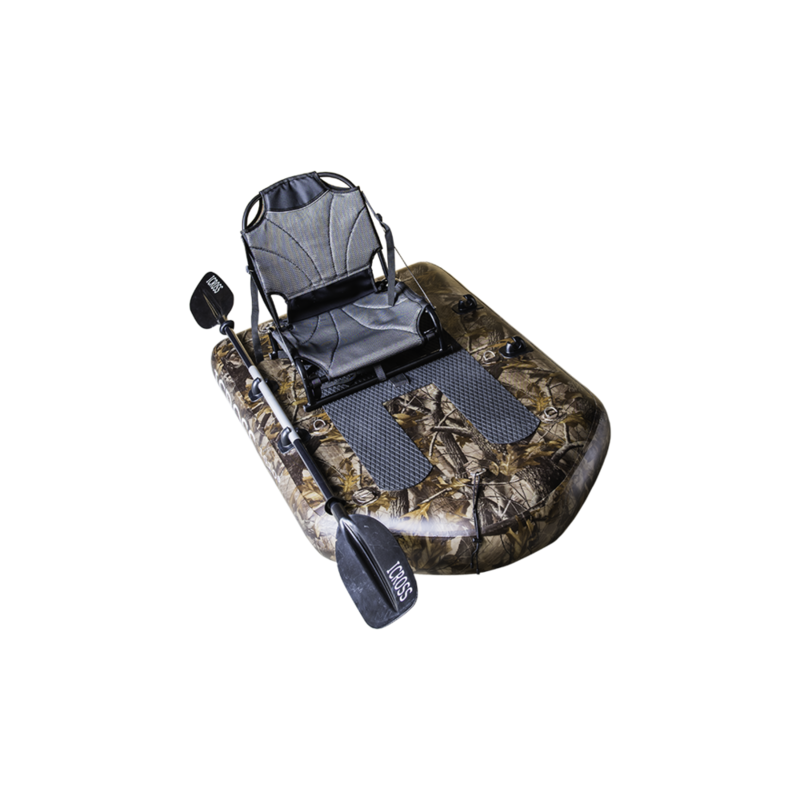 Suitable areas of use are: fish kayak, great for all types of angling, beaver hunting, wildfowl hunting. Incredibly smooth and stable shooting platform. Our bestseller is ICROSS 1410. The ICROSS® take you in the water easily, smoothly and safely. You do not have to sit in the cold water because you sit on a 20 cm inflatable rock hard airbag. It takes you to an island, to the other side or for a reason - it makes your fishing hugely flexible because you can also fish from it. The ICROSS® creates brand new opportunities for your future fishing adventure - it takes you to pristine waters. ICROSS® and belly boats are in size and weight very close together. But ICROSS® is paddling in the same way as a kayak. And you do not have to sit in the cold water, because you sit on a 20 cm inflatable rock hard airbag. So ICROSS® becomes a mixture between them. The ICROSS® 1260 measures 126x88x20 inflated weight 6.5 kg. And comes with features adjusted for fly fishing, like two brackets on each side for mounting a paddle. An EVA non-slip seat. A centered, high quality, carrying strap. Flexible cord on the back for attaching a drybag. Four D-rings on top, to attach a seat (sold separately). Four D-rings on the bottom to attach backpack straps. D-ring in front. Flexible cord in front for easy securing up to three rods. The ICROSS® 1260 also comes with: Powerful double-action pump. Repair kit. The ICROSS® 1410 measures 140x95x20 inflated weight 7.5 kg. And comes with features adjusted for fly fishing, like two brackets on each side for mounting a paddle. An EVA non slip seat. A centered, high quality carrying strap. Flexible cord in back for attaching a drybag. Four D-rings on top, to attach seat (sold separately). Four D-rings on the bottom to attach backpack straps. D-ring in front. Flexible cord in front for easy securing up to three rods. The ICROSS® 1410 also comes with: Powerful double-action pump. Repair kit. The ICROSS® 1206 measures 126x88x20 inflated weight 6.5 kg. And comes with features adjusted for fly fishing, like two brackets on each side for mounting a paddle. An EVA non-slip seat. A centered, high quality, carrying strap. Flexible cord on the back for attaching a drybag. Four D-rings on top, to attach a seat (sold separately). Four D-rings on the bottom to attach backpack straps. D-ring in front. Flexible cord in front for easy securing up to three rods. The ICROSS® 1206 also comes with: Powerful double-action pump. Repair kit. USING DROP STITCH, Goodyear created an inflatable plane for the military in the 1950’s. HOWEVER, the US military abandoned the inflatable plane project (nobody wanted to fly an aircraft that could be brought down with a bow and arrow). By using tens of thousands of tough polyester threads, drop stitch technology lets us build inflatables with flat surfaces that marry the durability and performance of hard-shell craft with the mobility and easy storage of inflatables. The process starts by joining two pieces of polyester woven support fabric with thousands of fine polyester thread lengths. Polyester thread is used throughout because it is strong, durable and has very little stretch. Up to 400 needle heads may be used in the setup. Each needle sews a continuous, evenly-spaced thread, back and forth between the two pieces of woven fabric, locking them together into an incredibly strong unit. These drop stitch sewing machines are marvels of complexity. When a change is made in the spacing distance between the two pieces of woven fabric, it can take more than 20 days to remove and replace the required needles. This creates an incredibly strong construction. — Ted Logardt, fly fisher, photographer and writer. Kusmark, Sweden.